Interfaces -> then to PPP tab and when I look for the interface link I have no options at all to select the dongle I have just put in the pfsense box. Check the system log with it unplugged. Plug it in and recheck. What new lines are shown? 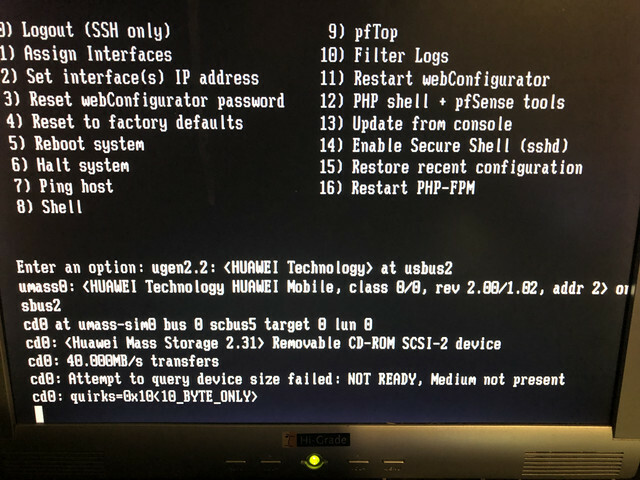 With it connected run at the command prompt usbconfig dump_device_desc show us that output. You need to choose option 8 at that menu to reach the command prompt, then run that command. Or do it from Diag > Command Prompt in the webgui. But we can see from that screenshot when you connected the modem that it's still running in virtual CD-ROM mode. That's the key part there. What is the model number it's actually labelled? That product ID is common to many Huawei devices. Anyway you will need to switch it out of that mode either by changing it permanently from Windows (may not be possible), reflashing the firmware or using USB modeswitch. Some modems are switched by u3g, some can be switched by just ejecting the virtual CD but this doesn't look like one of them. What do I reflash the usb device with? Many modems have different firmware available for different carriers or regions or different modes like Hi-Link (router) or modem mode. There may be one or more available for your device. It would be better to permanently switch it which might be possible from it's interface in Windows or Mac.